I'm busy pulling together my "Homespun Glam" Christmas. 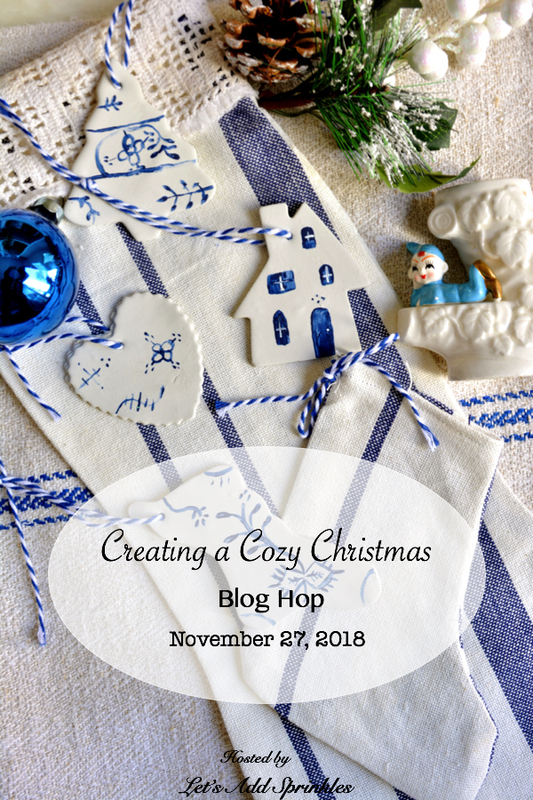 Stop by Tuesday for some great inspiration as 11 bloggers come together for a Creating A Cozy Christmas Blog Hop. I'll be sharing how to make these ornaments. I hope you had a blessed Thanksgiving. Are you decorating this weekend for Christmas? These are sooo cute...hope I can make a few for my tree. I was planning on it. Till Rick gave me the leftover carpet from his upgrade and we had to have it installed this weekend. I don't think my house has been this torn up since I moved. To add to the mess, the five-shelf bookcase (albeit not a good one) came apart while moving the furniture and now I have about 200 cookbooks sitting on the ledge till we can either fix it or I can rapidly replace. I hate rapid replacement! Sounds like lots of fun Katie. I always love to see everyone's decor.